A long, multi-color crochet scarf. As with all of Kristin Roach’s Craft Leftovers patterns, it is intended to be made with leftover bits of yarn from stash. Directions call for 1/2 skeins of 3 colors of worsted weight yarn. 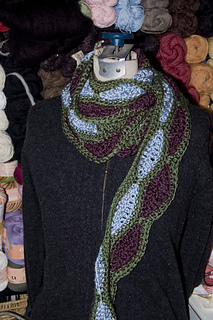 Scarf length can be adjusted by changing the number of pattern repeats. One pattern repeat is 4.5”.